Search for realistic solutions inevitably leads us to one of the most fundamental questions of our time: who will bring about the many changes that must occur in the lives of billions of people. Developing moral capabilities is a prime need in our NSS programmed and for this reason we have developed a module on value education to train programmer officers in developing their knowledge and inculcate the same among students during camps and regular activities. 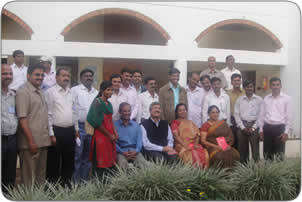 The training was imparted at Bahai Academy, Panchgani. By this time 120 programme officers are trained and 98 study groups of 20 NSS volunteers each are formed at 98 colleges, Impact of this education is really amazing Methodology of this programme is cooperative and participatory.